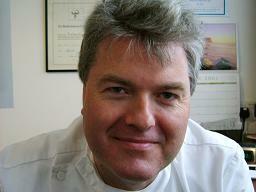 David Harrison Osteopath and CranioSacral Therapist Taunton Somerset. Babies children and adults. David G. Harrison D.O., M.R.O. The principal practitioner, David G. Harrison D.O., graduated from the 4 year full-time course at the British School of Osteopathy in 1987, and built up a busy multidisciplinary practice in North-West London for 13 years before moving with his family to Taunton in the summer of 2000. With over 30 years in practice, and specialist training in Paediatric Cranial Medicine, David is one of the most experienced practitioners in Taunton and the South West. To maintain his skills, and to keep up to date with the latest research and developments, David undertakes at least 50 hours a year of coninueing professional development, including assisting teaching cranial courses. Established over 45 years ago, the practice is located in comfortable and relaxing purpose-built premises attached to the practitoner's home in a residential, and easily accessible, road one mile south of Taunton town centre. Just 5 minutes from junction 25 of the M5, the clinic is easily reached from Bristol and Exeter, and even has a number of clients who drive down from London. There is ample free parking in the road outside the practice. David's original training and qualification was in Classical Osteopathy. He has subsequently developed his specialization in Cranial Osteopathy, which he initially studied with the College of Cranio-Sacral Therapy, before further study to Advanced level with the Upledger Institute. His particular specialization, and the area in which he has done the most study and research, is Paediatric CranioSacral Medicine, working with babies (the youngest to date being just 20 minutes old), toddlers and teenagers. He has an excellent reputation with local therapists, both conventional and complementary, a large part of his workload coming via referrals from doctors, midwives and health visitors. He also uses Therapeutic Imagery and Dialogue (TID) and Somato-Emotional Release (SER), specialist techniques pioneered by the Upledger Institute in America, mostly with teenage and adult patients. These methods access and release chronic emotional blocks that can hold a person back from reaching their full potential.